Gilberto Cetina, Katherine A. Diaz, & Gilberto Cetina, Jr.
Home/Authors/Gilberto Cetina, Katharine A. Díaz, & Gilberto Cetina, Jr./Gilberto Cetina, Katherine A. Diaz, & Gilberto Cetina, Jr.
Gilberto Cetina learned the secrets of cooking from his mother in a timber town in the Tizimín province of the state of Yucatán. A trained engineer, he moved with his family to the United States in 1986 where he was finally able to dedicate himself to the culinary arts. He worked in various restaurants and learned the ins and outs of the business. He opened Chichén Itzá Restaurant in 2001, and his Yucatecan dishes soon became the talk of the town among customers, foodies, food critics and other restaurateurs. Chef Cetina and the food of Chichén Itzá Restaurant have been lauded in such publications as GQ Magazine, Los Angeles Times, Travel and Leisure Magazine, People en español, Hispanic Magazine, L.A. Weekly, La Opinión, City Beat and Adelante. They have also been featured on radio and television, including hit food shows. Chef Cetina has been a spokesperson for Splenda, was featured in a national Hyundai ad campaign, teaches classes in Yucatán cuisine, and is in demand for events showcasing the best of Mexican culture and cuisine. His restaurant is invariably named as one the top Mexican restaurants in the greater Los Angeles area. This was his first cookbook Spanish-language edition was printed in 2014. He is already developing additional cookbooks and is planning a series of cooking classes as Webinars. He can be reached at: chefcetina@chichenitzarestaurant.com. Katharine A. Díaz is a self-described foodie. She is also a food and travel writer specializing in Latin America, where she has traveled widely. She has worked as editor of several publications, including such national magazines as Hispanic, Caminos and Mexico Events and Destinations. Her work has also appeared in other publications, including Segunda Juventud (an AARP publication now titled AARP Viva), Latino Magazine, VISTA, Aboard Magazine, Hispanic Magazine, Corporate and Incentive Travel Magazine, Insurance Meetings Management Magazine, Recommend Magazine, Hispanic Trends, and San Fernando Sun. 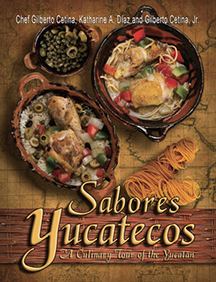 Díaz also authored several entries, including ones about Latino cuisine and restaurant culture, in the Encyclopedia Latina (Scholastic Library Publishing). She also is the long-time host of “Canto Tropical,” an Afro-Cuban/salsa music show on KPFK-90.7 FM in Los Angeles. This was also her first cookbook until the Spanish-language edition came out in 2014. She is currently editing and writing other cookbooks as well as young-adult, historic fiction. She can be reached at: kanndiaz@yahoo.com. Gilberto Cetina, Jr., was on a different career path before the family business got under his skin. In Mérida he was studying computer science before his studies were interrupted, and he returned to the United States to rejoin his family in 2000. Back in the States he worked at various restaurants, including on the catering side of some. He didn’t begin working at Chichén Itzá Restaurant until a week after it opened in 2001. In the beginning he worked the front of the house. Eventually, he began to focus on the kitchen and learn the secrets of his father’s (and grandmother’s) cooking. It wasn’t too long before he mastered them and brought innovations to the kitchen. He now runs the kitchen full time and manages the day-to-day operations of the restaurant. 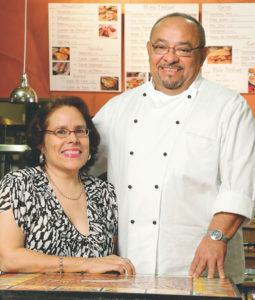 When time permits, Gilberto enjoys experimenting and putting new twists on traditional dishes. 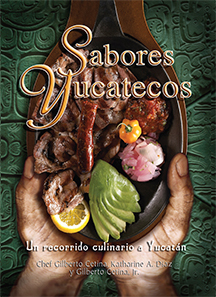 It might not be too long before he publishes his own cookbook on la nueva cocina yucateca—the new Yucatecan cuisine. In the meantime, he is his father’s right-hand man. He can be reached at: gcetina@chichenitzarestaurant.com. Author: Gilberto Cetina, Katherine A. Diaz, & Gilberto Cetina, Jr. Author: Gilberto Cetina, Katharine A. Diaz, & Gilberto Cetina, Jr.